MONTREAL, Feb. 11, 2019 /CNW Telbec/ - SEMAFO (TSX: SMF) today announced a maiden inferred mineral resource for the Bantou Zone of 2,100,000 tonnes at 5.35 g/t Au for 361,000 ounces of gold. The Bantou Zone is located approximately 170 kilometers south of the Mana Mine in Burkina Faso. Bantou is one of several targets the Corporation explored in 2018 on the Dynikongolo permit. The 2018 program included a core drill program to test the down plunge extension of the Bantou Area and an RC program to explore proximal targets and the Tankoro Zone. Benoit Desormeaux, President & CEO, stated: "Congratulations to the exploration team for delivering the first of many important new discoveries and resource updates. Bantou is located within the prospective Houndé Greenstone Belt that hosts Mana and multiple other gold mines, and is an area we know well. We look forward to what the 2019 exploration program will bring in terms of resource growth." Bantou is located on the Dynikongolo permit, approximately 170 kilometers south of Mana, along the prolific Houndé Greenstone Belt that hosts Mana and multiple other producing gold mines. See Figure 1 for the location map. The permit is rectangular and measures approximately 10 kilometers along the southern and northern boundaries and 25 kilometers along the eastern and western boundaries. The permit is contiguous to Savary's Karankasso Project. 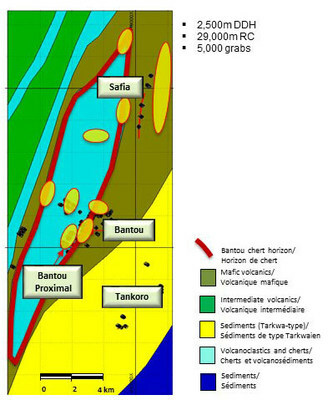 Based on limited drilling to date, there are two known mineralized zones: Bantou and Tankoro. 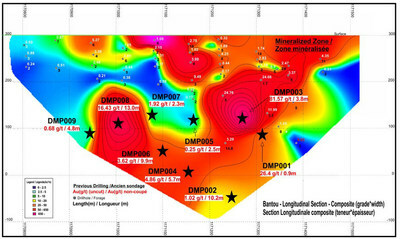 Drilling on the Bantou Zone was designed to test the down plunge potential to better understand and characterize the mineralization, and to also test the southern extension of the mineralization. A total of 13 core holes (4,245 meters) were completed down dip (see Table 1 for highlights). Results continued to show high-grade mineralization along the plunge of the deposit including 52.97 g/t Au over 5.9 meters (DMP-003) and 16.43 g/t Au over 13.0 meters (DMP-008). A total of 19 RC holes (2,588 meters) was completed along the near-surface southern extension of the deposit, returning values of up to 12.36 g/t Au over 4 meters (KRC18-0102). Five samples were tested for preliminary recovery at the Mana mill, and results suggest an average recovery in the order of 90%. Further testing will be required to better define the best metallurgical approach. All lengths are along the hole axis, and the true thickness has yet to be established. All assay results are uncut. The Bantou mineralization is constrained by two parallel zones of cherts and banded iron formations (BIF) separated by a late mafic intrusive dyke. The stratigraphy appears consistent from hole to hole and shows excellent continuity and regularity. The gold is spatially associated with pyrite-magnetite bands and stringers with locally minor galena. The zones appear to show evidence of primary BIF-type mineralization although orogenic enrichment could also have contributed to the higher-grade portions. Regionally, the favourable horizon sits within a folded sequence of volcanoclastic rocks, underlain by mafic volcanics. Bantou is located on the east flank of a property-scale synclinal fold, while the west flank outcrops within the permit, approximately four kilometers to the west. Permit-scale mapping completed in 2018 shows that the favourable horizon extends approximately 10 kilometers both north and south of the Bantou mineralization. A regional-scale drilling program tested different target areas identified from previous work and surface mapping. Among these, the Bantou Proximal Zone was identified 500 meters west of the Bantou Zone. 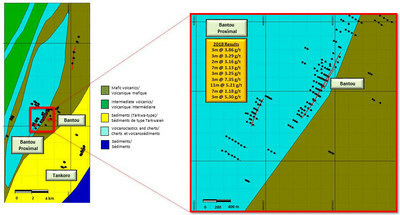 See Figure 3 below for location of Bantou Zone and Bantou Proximal Zone and related drill holes. A total of 20 holes (2,813 meters) was drilled over a strike length of 400 meters. Significant near-surface results, including 5.21 g/t Au over 11 meters (KRC 18-180), were obtained over the strike length which remains open in all directions. Mineralization at Bantou Proximal is characterized by a sericitized and silicified felsic dyke dipping steeply to the west. In addition to the dyke itself, gold is locally present in the host volcanoclastic rocks that are also altered and mineralized with disseminated pyrite. The Tankoro target is located to the southeast of the Bantou Zone, where artisanal mining and historical drilling had returned interesting results. A total of 14 holes (2,405 meters) was completed on four sections covering one kilometer of the favourable strike length. Significant highlights are listed below in Table 3. 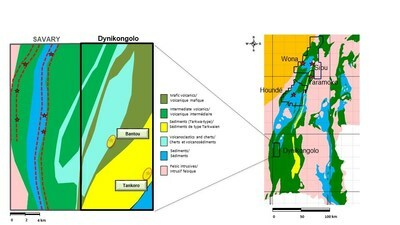 Mineralization at Tankoro is characterized by two parallel felsic dykes approximately 30 to 50 metres apart. Both dykes and surrounding volcanoclastic rocks are sericitized and contain disseminated pyrite. An important observation at Tankoro is the thick saprolite reaching up to 50 meters. Although the Tankoro drilling also returned attractive values in fresh rock, preliminary metallurgical testing suggests recoveries in the order of 60% using milling parameters of the Mana mill. Prior to further drilling, further work will be carried out to improve the recoveries in order to establish the viability of this target. Given the prospectivity of the combined Savary-Bantou properties, the Bantou exploration budget of $3 million will be enhanced if, and when, the proposed transaction with Savary Gold Corp. proceeds as planned. For core drilling, all individual samples represent approximately one meter in length of core, which was sawn in half. Half of the core is kept on site for reference, and its counterpart is sent for preparation and gold assaying to the ALS laboratories in Ouagadougou, Burkina Faso, or Yamoussoukro in Côte d'Ivoire. For RC drilling, all individual samples represent approximately one meter in length of rock chips homogenized and riffle-split to an approximately 2-kilogram subsample that is sent for preparation to the ALS Minerals Services laboratories in Ouagadougou, Burkina Faso, or Yamoussoukro in Côte d'Ivoire. Each sample is fire-assayed for gold content on a 50-gram subsample. In addition to ALS's own QA/QC (Quality Assurance/Quality Control) program, an internal quality control and quality assurance program is in place throughout the sampling program, using blind duplicates, blanks and recognized industry standards. Richard Roy P. Geo, Vice-President Exploration, is the Qualified Person for the information contained in this press release and is a Qualified Person within the meaning of National Instrument 43-101. The estimate was prepared using a block model constrained within 3D wireframes of the principal mineralized domains. Values for gold were interpolated into blocks using a 3-pass ordinary kriging (OK) interpolation method. High grade assay values were capped at 50 g/t Au and bulk densities from 2.3 g/cm3 to 2.8 g/cm3 were used based on weathering. A preliminary open pit optimization algorithm was run on the estimated grade block model to constrain the resource. The resource estimate assumes a long-term gold price of US$1,500/ounce. The mineral resource estimate comprises mineralization contained within the preliminary pit shell at cut-off grades ranging from 0.43 to 0.56 grams of gold per tonne and mineralization below the pit shell at a cut-off grade of 2 grams of gold per tonne. The Mineral Resources were estimated as at December 31, 2018 in accordance with the definitions adopted by the Canadian Institute of Mining Metallurgy and Petroleum and incorporated into National Instrument 43-101 – Standards of Disclosure for Mineral Projects (NI 43-101). Mineral resources estimates for the Bantou Zone were carried out by an in-house team under the direction of François Thibert P.Geo MScA, Manager, Reserves and Resources Estimation Group, and SEMAFO's Qualified Person. This press release contains forward-looking statements. Forward-looking statements involve known and unknown risks, uncertainties and assumptions and accordingly, actual results and future events could differ materially from those expressed or implied in such statements. You are hence cautioned not to place undue reliance on forward-looking statements. Forward-looking statements include words or expressions such as "targets", "preliminary", "suggest", "first of many", "will", "growth", "further", "next steps", "committed", "building", "leveraging" and other similar words or expressions. Factors that could cause future results or events to differ materially from current expectations expressed or implied by the forward-looking statements include the ability of the 2019 exploration program to bring resource growth, the ability to carry out further testing to better define the best metallurgical approach, the ability to complete the proposed transaction with Savary Gold Corp. and increase the $3 million Bantou exploration budget in 2019, the ability to establish the viability of the Tankoro target, the ability to execute on our strategic focus, fluctuation in the price of currencies, gold or operating costs, mining industry risks, uncertainty as to calculation of mineral reserves and resources, delays, political and social stability in Africa (including our ability to maintain or renew licenses and permits) and other risks described in SEMAFO's documents filed with Canadian securities regulatory authorities. You can find further information with respect to these and other risks in SEMAFO's 2017 Annual MD&A, as updated in SEMAFO's 2018 First Quarter MD&A, 2018 Second Quarter MD&A and 2018 Third Quarter MD&A and other filings made with Canadian securities regulatory authorities and available at www.sedar.com. These documents are also available on our website at www.semafo.com. SEMAFO disclaims any obligation to update or revise these forward-looking statements, except as required by applicable law.